I don’t know about you but I know when I am being watched. I get a prickly sensation on my skin and the hairs on the back of my neck stand up. This, along with a heightened sense of alert. The phenomenon has a name, scopaesthesia. I looked it up on Reddit a while back. It is described as a psychic staring effect. There seems to be some disagreement about what makes it happen but my guess is that it is a primal instinct, a form of extrasensory perception. I am being watched now. As I walk home along Lostwithiel Street, I am sure I’m being observed. Not by a CCTV camera but by a real-life person. Looking around me, I can’t spot anyone. There are only a handful of people on the street and they all seem to be minding their own business. Possibly it’s someone from a window of one of the houses. Or from a parked car. Someone from a distance with binoculars maybe. But whoever it is, the surveillance is quite deliberate. Why would anyone be watching me? Working in quality control at the flag factory, I have little status and outside of work, I keep myself to myself. But for whatever reason, someone has me firmly in their gaze. I first became aware I could detect being watched when I was very young. In the playground, in fact. It got me into no end of fights, most of which ended badly. On the plus side, in my teenage years, my gift got me laid a few times because I was able to tell in a crowded room, without having to look around, which girls were showing an interest. But in truth, these episodes were rare. There was Katherine. Then Rebecca. And Jennifer. Then there was Natalie and before I knew it Natalie was pregnant with Anthony. We were not yet twenty one. Anthony is nearly ten now. He’s a strange lad but he doesn’t appear to have inherited my gift. I have learned over the years to keep my ability to myself. Sometimes though, when I am out shopping with Natalie, I might tap her on the shoulder and let her know that someone is watching me. I’m not sure why. Her reaction is usually one of exasperation. When I successfully point out the person who has been staring at me, she still refuses to acknowledge it. She tells me I am imagining it. As I turn into Restormel Terrace, the prickly sensation becomes stronger. My skin feels like ice on fire. My observer must surely be closer. There could perhaps be more than one person. But this is an empty street and has no obvious common observation points with Lostwithiel Street and I can’t see anyone following me. If they are, they must be well camouflaged. I begin to worry about my safety. What if the watcher has a gun? Is a madman? I know I’m not a celebrity or a political figure, but these things can happen, even down here in the south-west. If you’ve never experienced the sensation when you know for certain someone unseen is following your every move, you probably won’t understand what I’m talking about. I am thankful to arrive home safely. At first, I think nothing of Natalie’s absence. I expect some of you have partners who are unexpectedly called upon to work late at the office, the nail bar or the foundry or wherever it is they work. Mr Van der Merwe probably had an unscheduled meeting with a difficult client or Kimberley Drewitt failed to turn in again and Natalie had to fill in. And, I imagine that Anthony is round at Dominic’s watching the snowboarding or waterboarding or whatever it is they are into this week. Nevertheless, I am unable to settle. When the police call round, I realise that something is wrong. Things are getting out of hand. Meanwhile, the one with the bad breath and the handcuffs twists my arms behind my back. It is clear to me there has been a mix-up. The person they are after appears to have the same name as me. A simple misunderstanding, a clerical error. I tell them that they have got the wrong Mr Fargo. How many Frank Fargos can there be? It is by no stretch of the imagination a common name. I thought I might have been the only one but the name came up in a story I read a while back by Philip C. Dark. Or maybe it was the other fellow? The one who wrote Three Sides to Every Story? I don’t know how I came to read it, really. It was one of those nonsensical post-modern stories, where the text refers to itself and the author appears, not my sort of thing at all. I insist that despite the name being uncommon around these parts, they have made a mistake. I am clearly not the Frank Fargo they are looking for. I have done nothing that could warrant this heavy-handed treatment. I always pay bills on time, I tell them, I don’t park on yellow lines and I don’t even cheat at golf. This results in a hefty thump to the ribs. Further protests of my innocence result in yet heavier blows. This is not a routine investigation. These are not your everyday policemen. Many of you will no doubt have discovered that when you are least expecting it, your fortunes plummet. It quickly becomes apparent things are no longer going to be as they were. You find yourself in a dark forbidding place a long way from where you want to be. Your unexpected place might be metaphorical. On the face of it, mine appears not to be. Mine appears to be all too real. I find myself in a dark, dank subterranean pit. I don’t know where this place is or why I have been brought here but so far as I can tell I have been held captive for what seems like days. There are no windows and a tube light that flickers off and on. The walls are covered with anatomical illustrations. There is a rusty metal cabinet in the corner with some scientific equipment and some dusty old science books and one or two on psychology. Perhaps it was once a laboratory. Perhaps I am part of some grisly experiment. I have been subjected day and night to random sound effects, the kind you might expect in a chilling supernatural drama on TV. Every now and then, I hear footsteps coming down stone stairs and a bowl of what tastes like banana flavoured broccoli is pushed through a hatch. This is the nearest thing to communication that I have with the outside world. If sleep deprivation is my captors’ intention then they have certainly cracked it. If an interrogator were to come in now, I would be likely to tell them exactly what they wanted to hear. But, what is it they might want to hear? How have I transgressed? Or perhaps more pertinently, how has my namesake, whoever he might be, transgressed? Is he a spy? Is he a killer? Whatever, I would confess. I would be the Dorset Ripper. I would be the one who defaced the Mona Lisa. I would be the one who shot Prince Philip. I would be any of these things if it would get me out of this hell hole. But, this seems a long way off. I don’t get the impression that anyone is even watching me now. If you find yourself in a desperate place, and happen to have a neuro linguistic programming workbook, I recommend you take a look. Don’t ask me how it works but with a little practice, NLP can entirely change your outlook. Demons are there to be conquered. NLP can see off fears and phobias, delusional disorders, depression and insomnia. In a word, it will help you to transform your life. There’s probably no end to what can be achieved with NLP. You are your own master. You set your own goals. You will probably win the lottery. I am sitting with Natalie at a table in Rick Stein’s restaurant eating Dover sole a la Meunière with a side of salad leaves freshly picked from Jeremy Corbyn’s allotment. Perhaps Jeremy needs to do a little more work on the red chard but this is a minor point. I can see more clearly now. My delusions are in abeyance. No-one is watching me at the moment. Natalie and I are even sleeping in the same bed again and Anthony seems to have settled down at his new school. We could even be looking at a happy ending to the story. But of course, like everything in life, things could change at any time. The whole hullabaloo could start up again. I need to work on that one. I suppose I could dress down, get rid of my red coat perhaps and wear more grey or brown. I could maybe get one of those drab zip-up jackets that you see old people wearing along the strand in South Devon seaside towns. Or to take it a little further, I wonder whether given time and some advanced mindskills training, I might even be able to become invisible. That would surely solve the problem. Or better still, perhaps I could become fictional. Frank Fargo, after all, is a good fictional name. I could be a character in one of Philip C. Dark’s mysteries. Or the protagonist in one of that other fellow’s. The one who wrote Three Sides to Every Story. You’ve probably read one or two of his tales, haven’t you? I wish I could remember his name. It’s on the tip of my tongue. …… Chris something. …… No, it’s not coming. The coach has just left the bus station. We are waiting at the lights when, through the back window, I catch a glimpse of a man in a balaclava. He is running through the crowd. He has a handgun. He waves it around. He is shouting something. He begins to fire shots indiscriminately at the passengers in the bay next to the one our coach has just drawn out from. I am paralysed. I can’t believe this is happening. The lights change and our coach moves off. The man in the balaclava fires more shots. ‘Did you just see that?’ I shout to the woman who is sharing the long back seat with me. It is a pointless question. It is clear that she didn’t see anything. She has her head in a Jodi Picoult paperback. Change Of Heart or something like that. She is about forty and dressed for a long journey with lots of layers, maroons and purples. She is surrounded by a good selection of mismatched travel bags. She is using the luggage to guard her space. She does not want anyone else to take the seat. Her body language further suggests that she does not want to enter into a conversation with a strange man on a coach, especially one who is behaving hysterically. ‘What!’ she says, not looking up from her book. ‘There was a man firing shots,’ I say. ‘What are you talking about?’ she says, maintaining a level of disinterest. She even manages to turn a page. I point out of the back window, and she starts to pay a little attention, but we are now some distance away and it is difficult to make out anything through the traffic and the drizzle. The man in the seat in front of us has turned round. He gets up from his seat and comes back to where I am sitting and wipes the window with the sleeve of his jacket, but it is too late. The coach has turned the corner. I want to tell him I am sure I saw the gunman, but I feel intimidated. I wonder whether I should try to attract the attention of the coach driver, to get him to turn the coach around to check, but why would he believe me? Even if he were to go for my story, why would he want to put us all in danger? For all I know coach drivers have a procedure to follow when it comes to terrorist activity. They are probably required to put the passengers’ safety first at all times. I sit back down. Given the others’ reaction, I am already beginning to doubt what I saw. Sometimes when you are stressed the mind can play tricks. And I have been feeling a little odd lately, one way or another. All I want to do is get home. The coach is surprisingly empty. To avoid her getting any further interruptions, Jodi Picoult takes advantage of this and moves her bags up towards the front. Waccy Baccy, having returned to his seat keeps turning round to check what I am up to. I nod. I don’t feel this is someone I could get along with. I want to keep my distance. I wish he too would move further up the coach. As we get out on to the dual carriageway, I call Halo on her mobile, but for some reason, she is not picking up. Perhaps she is in the garden. Sometimes she sits out in the early evening with a glass of white wine. I try closing my eyes to relax myself but I keep seeing the image of the gunman. I can see him clearly now, much clearer than before, in his dark clothes. He is running, shouting. He has the gait of a young man, perhaps in his twenties. He is slim, athletic. 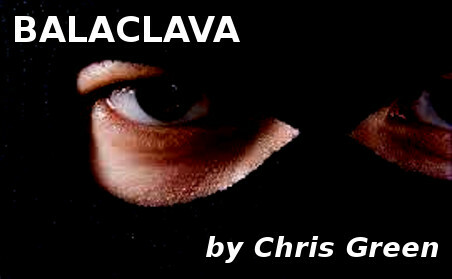 Most distinctively he has a balaclava to conceal his face. I remember learning at school that Balaclava gets its name from an 1854 battle in the Crimean War which was part of the Siege of Sevastopol to capture Russia’s principal naval base on the Black Sea. British troops used them to protect themselves against the bitter cold. They convey a more sinister message on the streets today. To most people they represent a warning that something bad is about to happen. The coach is supposed to have wi-fi but I can’t get anything on my phone. What I witnessed though is sure to be on the TV news later. It will be the main story. The gunman will probably have been shot by police marksmen, maybe in another location, He will have gone down fighting to further his cause. Martyrs help to raise the profile of terrorist organisations. This is one of their recruiting strategies. The newsreader will say how many people were killed and a reporter will interview some witnesses to the incident. A security expert with an unlikely name will suggest it is time to raise the threat level from substantial to severe perhaps even critical. Over the next few days, there will be speculation as to how the gunman slipped through the net. Why hadn’t the security services flagged up such an obvious killer? They will talk about radicalisation without anyone explaining exactly what radicalisation involves. I get home and switch on the news channel. Halo asks me what is wrong. I normally greet her with more fondness and almost never watch the news. ‘Haven’t you heard anything?’ I say. ‘I have no idea what you are talking about,’ she says. I think she may have had several glasses of wine. There is nothing about it on the news. There are reports of boatloads of migrants arriving on a small Greek island, and update on the Portuguese debt crisis and a lengthy analysis of England’s humiliating exit from the European Championships at the hands of San Marino. I give a detailed account of what I saw to Halo. ‘What’s got into you?,’ she says. ‘Why do you think it is that no one else saw it and it hasn’t made the news? You have been working too hard. I’ve noticed that you have been a little strange for the last couple of weeks. I’m worried about you. Perhaps you ought to take a few days off or go and see Doctor Stoner. I do not tell her that I have been taking a few days off work, in fact, I lost my job two weeks ago after they noticed I was behaving strangely, but knowing how disappointed Halo would be I have not got around to telling her. I have been going through the motions of going to work, but instead of staying in my usual accommodation which was tied in with the job, I have been hanging out with my old college friend, Jazz. Apart from anything else, Halo doesn’t approve of Jazz. As his name suggests, he is a musician and she understands that musicians have all kinds of bad habits. I start searching the internet. The web is often quicker off the mark with breaking news than television. There has to be something here. To my amazement though, none of the news sites has anything relating to this attack, or for that matter any attack. I google likely search terms in case the news media has overlooked it, coach station, balaclava, handgun, that sort of thing. Google comes up with pages and pages of special offers from National Express, cosmopolitan ranges of protective headgear and a bewildering array of handguns. Over the weekend, I can’t stop thinking about what I saw. More and more details about the incident come back to me. I explain this to Doctor Stoner. He tells me that I am delusional and my delusions, along with my erratic behaviour are likely to be attributable to skunk. Skunk, he explains, doodling on his desk pad, does not affect the brain in the same way that weed does. Traditional weed or hash has a balanced THC: CBD ratio. With skunk, the psychoactive element, THC is not balanced by the anti psychotic element, CBD. In a word, skunk is very high in THC and very low in CBD. This increases the risk of paranoia and even psychosis. ‘But I don’t smoke skunk, Doctor,’ I say. Sergeant Boss and Constable Newby arrive at the house in response to my 999 call. I give them a detailed account of what happened. Sergeant Boss makes careful notes and contacts colleagues on his radio. Constable Newby is just there for decoration it seems. He flicks through my CD collection. He takes a particular interest in the Nick Cave section. Surely he is not old enough to have heard of Nick Cave. Why is he trying to be difficult when I am trying to be helpful. ‘I’m telling you now,’ I say, trying to be assertive. ‘Not the middle of the crowd, Sergeant’ I say. ‘Ali appeared to be aiming at Norris and Shonda Grooms from Handsworth and Rolf Heller from Acock’s Green and they were all just a little back from the middle. He was not a very good shot. Perhaps he had been to the wrong training camp or perhaps he was self-radicalised. The first shot caught Norris Grooms in the right arm and the second shot missed all of them. The third shot hit Rolf Heller in the chest and he fell to the ground. The fourth shot ………..
‘You were able to see all this from the back seat of the coach?’ says Sergeant Boss. ‘Which people would that be Sarge?’ says Constable Newby. My phone rings and I pick it up. ‘Hello. Is that Icarus Hynes?’ says the voice. ‘Yes. Icarus Hynes speaking,’ I say. ‘Doctor Stoner here,’ he says. He sounds a little nervous. ‘What might those be, Doctor?’ I say.